I’m thrilled to have received a scholarship for the 2015-2016 Master Key Master Mind Alliance! The first of 26 weekly class webinars was Sunday September 27, and I’ve been enjoying doing the assignments, one of which is writing this first blog post. The bird waits in the egg, and in the highest vision of the soul, a waking angel stirs. When I read that, I paused and slowly said aloud: The oak sleeps in the acorn. I appreciated more than ever that I live near Raleigh, NC, The City of Oaks. 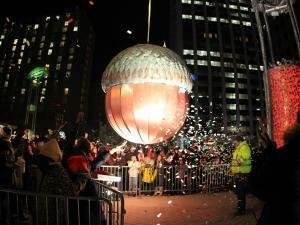 I felt the excitement and enthusiasm for new beginnings felt by the thousands of people who watch The Big Acorn get lowered from a crane in downtown Raleigh each New Year’s Eve. This first MKMMA week suddenly felt like New Year’s Day — full of hope and potential for many blessings ahead and the belief that anything and everything I desire IS possible. I smiled as I went to my back deck and looked at the several dozen acorns dropped there by the busy squirrels as they’ve performed their annual harvest of the many tall oak trees in my backyard. I appreciated how much nourishment the acorns provide, and then I appreciated even more that the squirrels are willing to do all the work of finding them and opening them. I marveled at the squirrels’ innate wisdom of eating some now and storing some away for the winter. Then I thought about how much the squirrels must DESIRE the acorns, and how such a strong desire is what helps the squirrels FIND the acorns — more proof of exactly “how it works” and what this excerpt from Hill’s book teaches. Then I thought about how rusty my ability to Desire is. But luckily, before I got feeling too discouraged, this sentence from Scroll 1 of Og Mandino’s The Greatest Salesman in the World reassured me: Failure will no longer be my payment for struggle. I am very grateful for this first blessing from my MKMMA Experience: I now have an image of myself as a mighty oak, asleep in an acorn but getting the nourishment and strength I need to break through the acorn shell and sprout and grow to my full potential. Thank you, @montymkmma. I appreciate your appreciation!